Mislabelling is normally a good thing for the buyer; not this time! Yes, I'd seen it when it was first listed, 10 days ago. Normally I'd message the eBay seller and tell them they needed to correct it. But because of the stupid price, I thought 'Sod em'. I thought Andre might have posted this one. 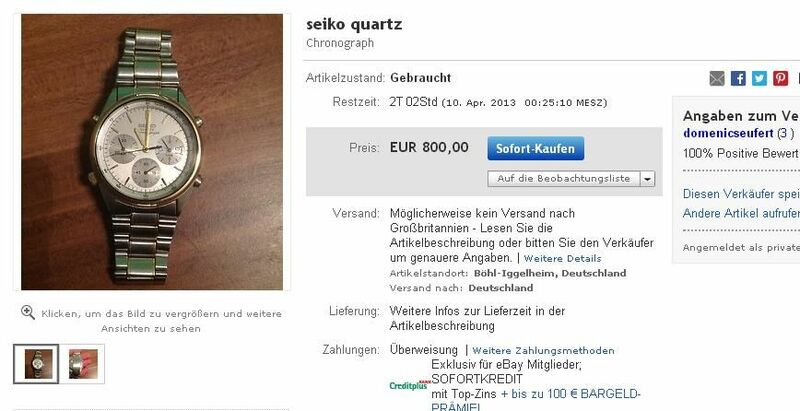 Seems like the trend for ridiculous pie-in-the-sky asking prices is catching on over on eBay Germany, too. How about a common-or-garden two-tone 7A38-7060 ? - Yours for a mere 800 Euros (and no offers) !!! I'll have to pass at the price though: $1500 / c. £1000! $1500 seems to be a favoured price point with over-optimistic would-be Italian eBay sellers lately. A LIMITED NUMBER AVAILABLE ON THE MARKET IN THESE CONDITIONS!!!! PS - I don't know these 7A28 Aliens well enough to speak with authority, but I suspect something is 'not quite right' with this one. Would anybody else like to comment ? I probably know them no better than you, Paul, but I can't see anything 'off' bar the price. Well, I'm going to go out on a limb here and say that I think this is a FRANKEN Aliens. I believe it is a combination of a JDM (SSAY058) and European export model 7A28-7000. It has a SpeedMaster Clasp and rectangular JDM Kanji inspection sticker - as opposed to the SEIKO SQ clasp and oval JWC II sticker. 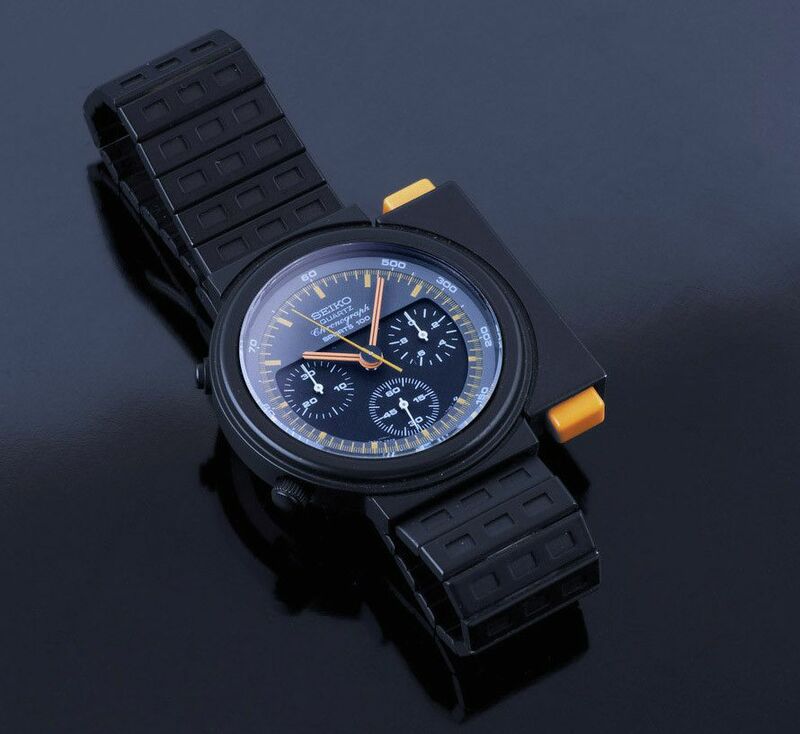 But instead of the JDM dial with SEIKO CHRONOGRAPH QUARTZ - it has the export SEIKO QUARTZ Chronograph SPORTS 100 dial. Anybody want to tell me I'm wrong ? 1: Why turn two into one? It's NOS by the looks so presumably any remaining parts would be also. 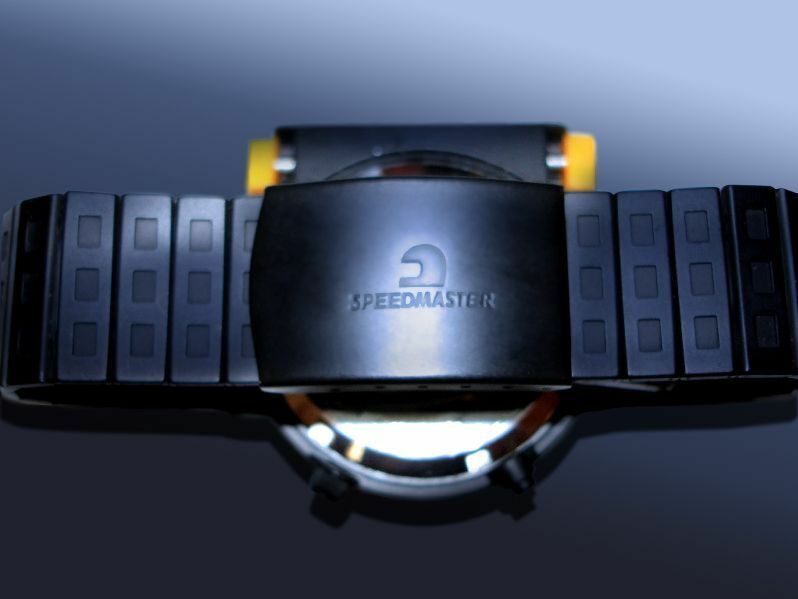 2: The Italian market appears to be an island compared to the rest of Europe regarding Seiko & is of course the land of the designer, Giugiaro. 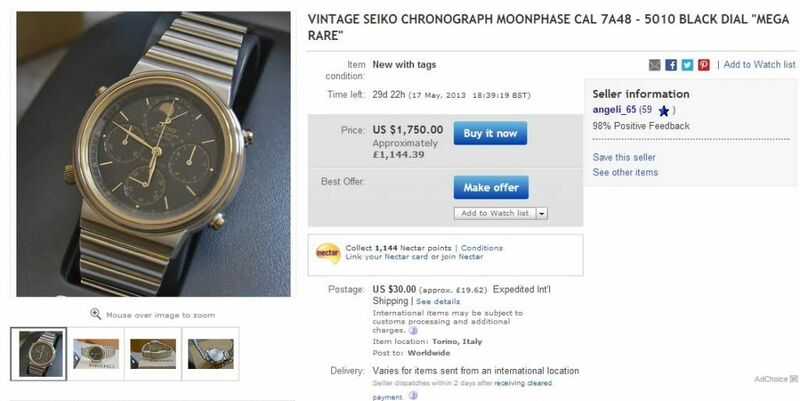 4: Is the seller somebody who once worked for Seiko Italy? Indeed, James - What is it with Italy (apart from the cars, the food, the women) ? 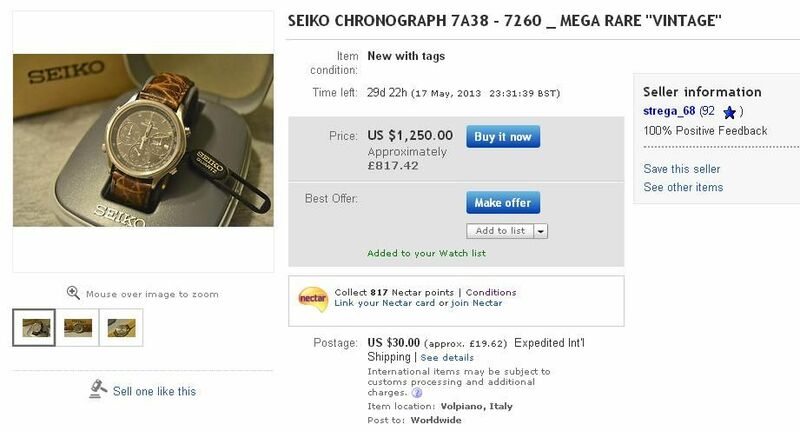 Specifically what is it with Italian eBay sellers and some of the stupid prices they ask for Seiko 7Axx's ? One of our 'favourite' Italian sellers strega_68 (partner of angeli_65) listed this used stainless 7A38-7190 earlier today - $750 !! But what is it about it that makes it MEGA RARE ? Apart from the sheer stupidty of their ridiculous asking prices, they do turn up the occasional gem, like this lovely NOS 7A48-5010. And yet another erm not-quite-so 'mega rare' offering from husband and wife team of Italian eBay sellers strega_68 and angeli_65. Desirable enough - but not for a stupid asking price like $1250 ! I'm sure the irony of this one won't entirely be lost on you, James. They may have given the item condition as New with Tags, but the strap fitted certainly isn't the original black padded Seiko calf ! 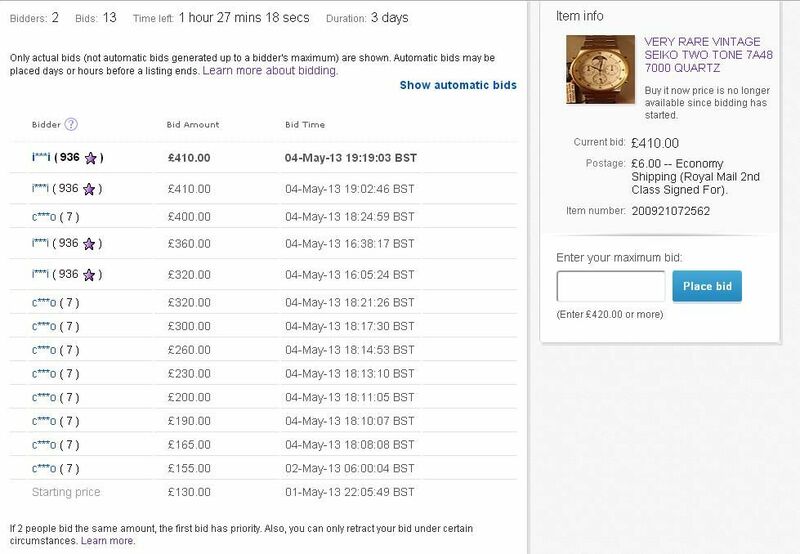 Anybody else watching this eBay auction for a fairly tidy looking 7A48-7000, ending in an hour or so ? with the obvious sole intent of promoting her eBay listing for a 7T59-6A0A - and got herself banned for her troubles. Naughty girl ! What makes the price that this 7A48 has been bid (or shilled) to even crazier is it's being sold with a flat battery (as was the 7T59) ! 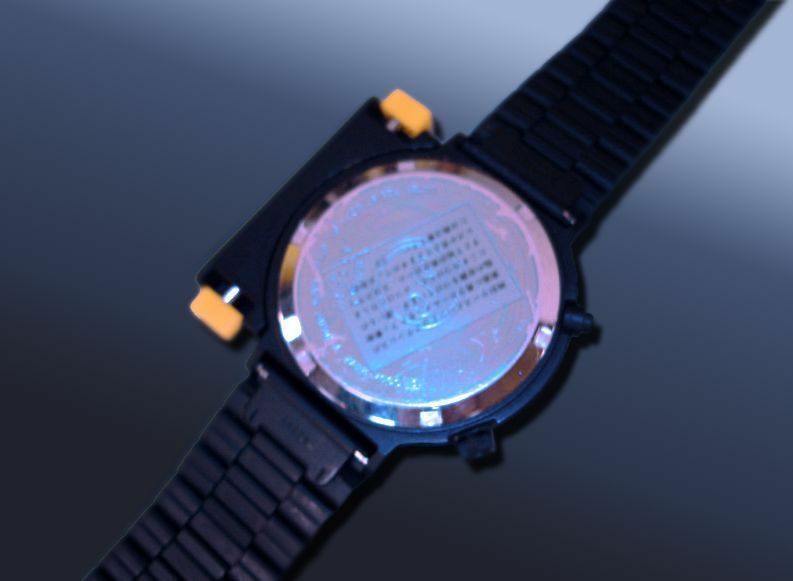 THIS WATCH IS RUNNING PERFECT. ALL CHRONOGRAPH FUNCTIONS ARE WORKING ALTHOUGH IT REQUIRES A BATTERY CHANGE. Check all three listing photos and the constant seconds hand is in exactly the same position (not even ticking every 2 seconds). 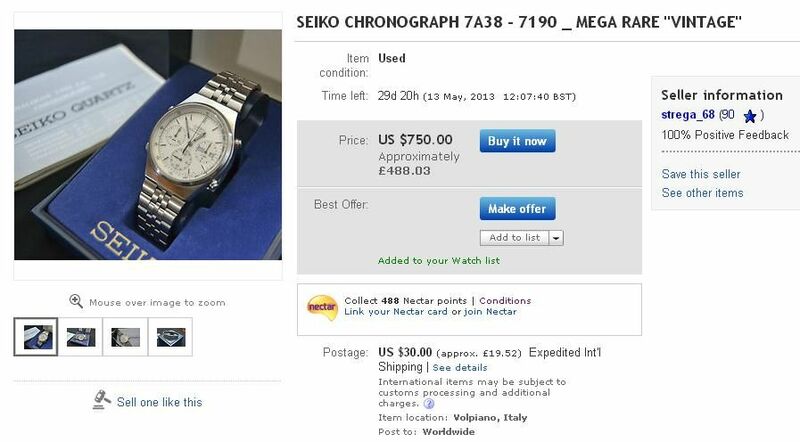 I suspect by now, having seen so many over-priced Seiko 7Axx's listed by Italian eBay sellers over the last year or so, we've all become a bit blasé. But I still had to smile to myself about Goffre78's latest batch of $1000 'Specials' listed earlier today. Firstly, I'd like to know what it is exactly that Goffre thinks makes his examples 'special'. and every single 7A28-710A that I've ever seen has had a yellow dial. In fact, the only one amongst them that is really 'special' is the 7A28-701A. Because I've never seen one on a leather strap before. 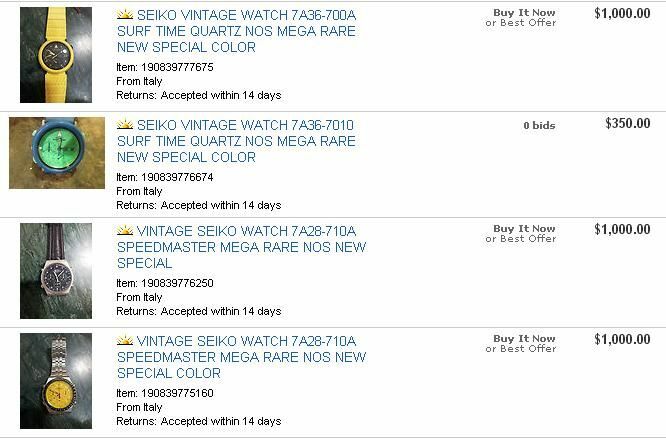 What I found amusing is in that right in the middle of this batch of new $1000 'specials', he'd re-listed the 7A36-7010 which I'd first noticed back in December last year, when it was halfway through a 30-day listing, and had already been reduced to $600 by then. Here it is 6 months later, reduced to $350 and re-listed for the third time at that price. Still no takers. So ugly he can't give it away. OT I know but the $2500 he's asking for a couple of scarce coloured H556s truly takes the biscuit. 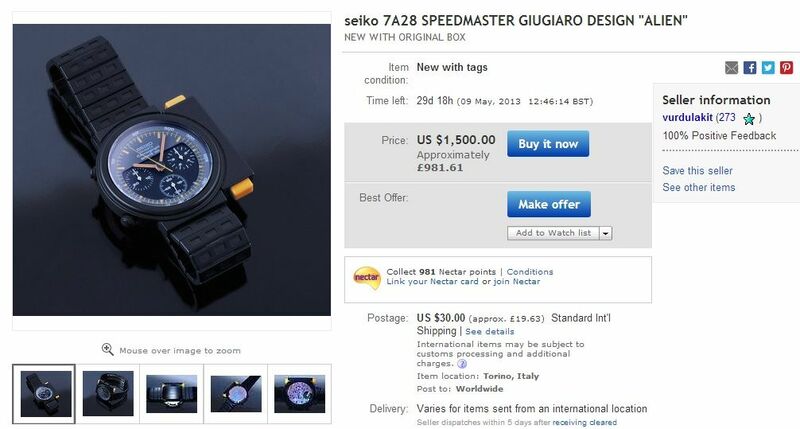 Yes, James - well for the scope of this forum, but relevant to the crazy Buy-it-Now prices asked by these Italian eBay sellers. But thankfully, in the words of Sir Michael Philip 'Mick' Jagger esq. it would seem they don't always get what they want. Let's just take husband and wife team of angeli_65 and strega_68 as an example. Indeed it was their (in fact her) first two listings for 7A38's back in January 2012 which started off this thread. Both the 7A38-704A and 7A38-7140 had the same astronomic pie-in-the-sky B-I-N asking prices of $2350. Yet the 7A38-7140 sold for a best offer of 'only' $800 - which I attribute to someone with no patience and 'more money than sense'. Then there was that lovely NOS 7A38-6000 that they first listed back in July 2012 with a hefty B-I-N asking price of $1500. On the 24th July, angeli_65 declined a more than generous offer of $800 - and then ended the listing early the following day. My comment read simply: But $1750 ??? .... which turned out to be 'only' $370 ! !